Hemp Bombs is extending its reach in the vaping market with the introduction of Hemp Bombs CBD Vape Tank Cartridges. These cartridges are pre-loaded with our bold e-liquid flavors and enriched with CBD. Vape Tanks come in concentrations of 125mg, 300mg, and 1000mg offerings, with different strengths for users of all experience levels. Hemp Bombs Vape Tank Cartridges are the pre-configured solution for vapers looking to incorporate CBD into their routine. Vape Tanks are user-friendly and don’t require the maintenance of other vape devices. Simply attach the universal 510 thread to a vape device and start enjoying Vape Tank Cartridges right out of the package. Cartridges are made of quality durable glass, not plastic. As always, Hemp Bombs uses premium ingredients for sourcing and production. Our products are manufactured with CBD Isolate and do not produce the psychoactive effects associated with THC. Our product quality and expertise is unrivaled in the CBD industry. CBD, or Cannabidiol, is a compound extracted from Cannabis plants. 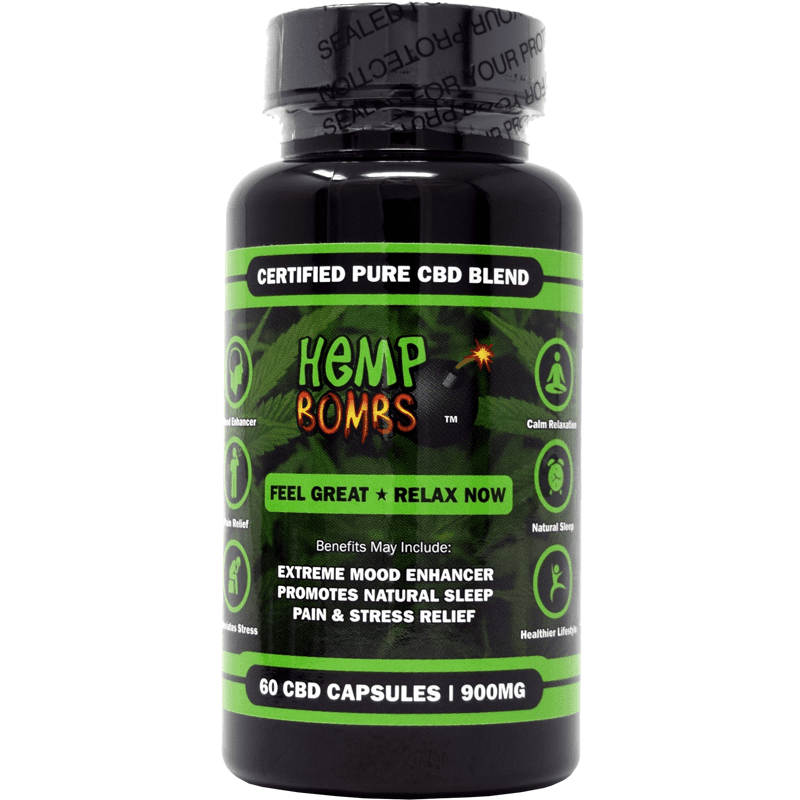 Hemp Bombs CBD is sourced from superior-grade Industrial Hemp grown sustainably, and our products don’t produce a “high.” Hemp Bombs products contain 99 percent pure CBD, and our CBD products undergo unbiased third-party lab testing to ensure purity. 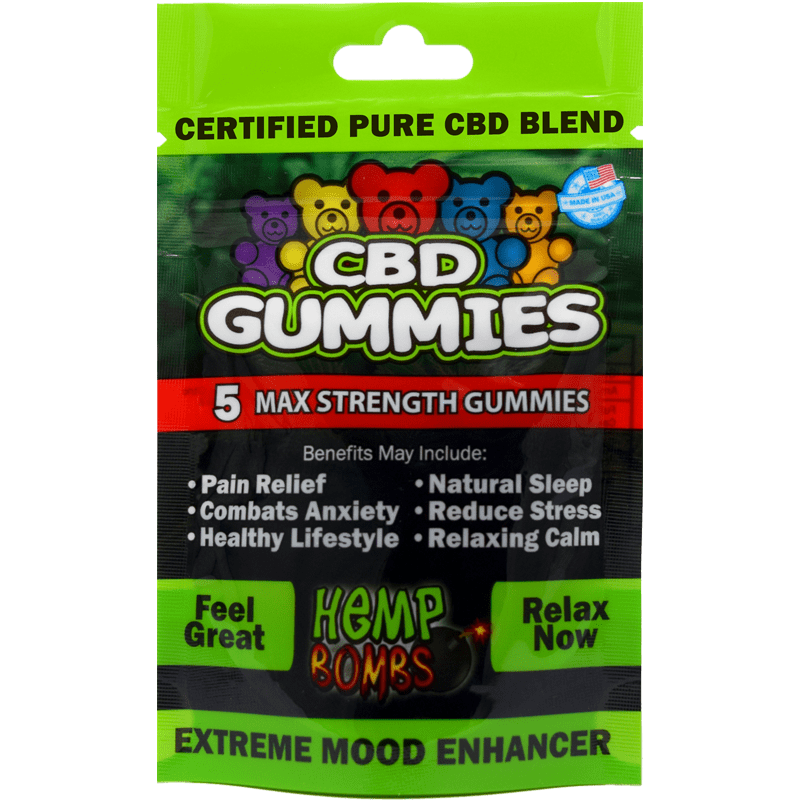 CBD has gained popularity because of its potential wellness properties, and it is sometimes called a “miracle compound” based on how the supplement interacts with the human body. It’s an all-natural supplement that has been shown to impact mental and physical health in extraordinary ways. CBD interacts with a system in your body called the Endocannabinoid System, or ECS. It’s a group of cell receptors that respond to cannabinoids – or compounds found in Cannabis – and it’s responsible for sleep regulation, inflammation control and more. Because of the Endocannabinoid System, CBD may help with problems like pain relief, inflammation, mood issues and social anxiety. CBD has also been shown to increase the amount of anandamide in the brain. Anandamide is a fatty neurotransmitter that’s sometimes called the “bliss molecule” because of how it can affect your demeanor and mood. Additionally, CBD can give your immune system a boost and promote overall wellness, which may leave you feeling better even if you don’t have any health issues. CBD that originates from Hemp is federally legal. Additionally, Hemp CBD won’t cause anyone to get “high.” That’s because it only contains trace amounts of tetrahydrocannabinol, or THC – the substance in Marijuana that produces psychoactive effects. Additionally, we use CBD isolate in every Hemp Bombs product, which contains zero THC. Can I refill a Hemp Bombs CBD Vape Tank? Hemp Bombs CBD Vape Tanks are intended for one-time use. We recommend our E-Liquid for any vaper looking for a product that can be used repeatedly. VG and PG stand for Vegetable Glycerine and Propylene Glycol, and they are considered essential components for vaping juice. Hemp Bombs Vape Tanks contain a 70/30 VG/PG split, which is formulated for maximum cloud production. What wattage should I use for my CBD Vape Tank? While our Vape Tanks are universal, there is a wide variety of factors between batteries and vape mods that can affect performance. Therefore, there is no exact answer on what wattage setting you should use. We recommend starting with low wattage and working your way up until you find a level that is most comfortable for you. If your device feels physically hot, your wattage is too high. If you notice some cracking or popping from your device when you vape, this is often normal and completely fine. 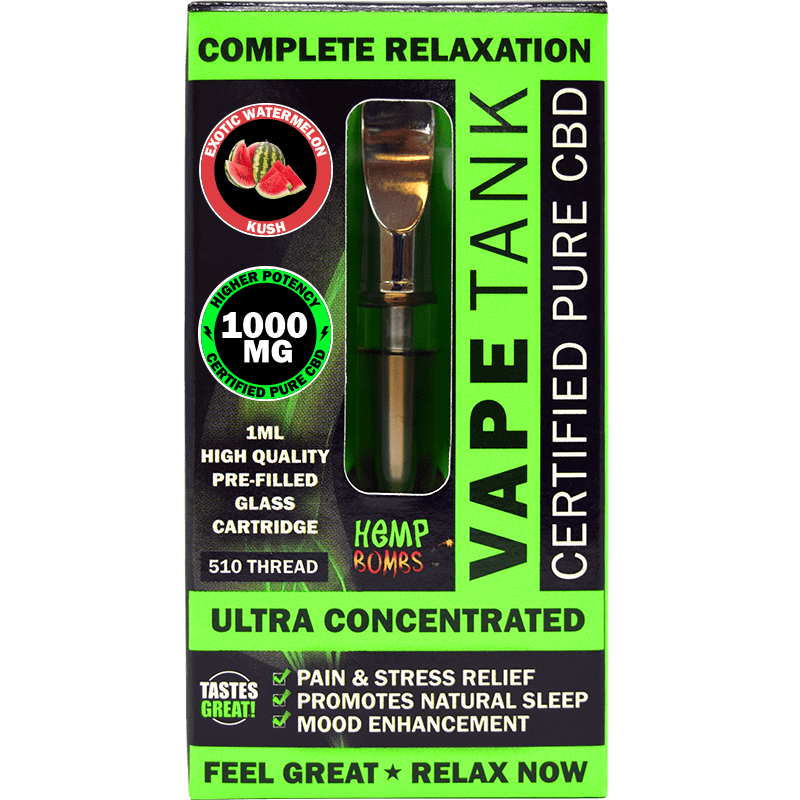 What’s the difference between a Vape Tank and CBD E-Liquid? 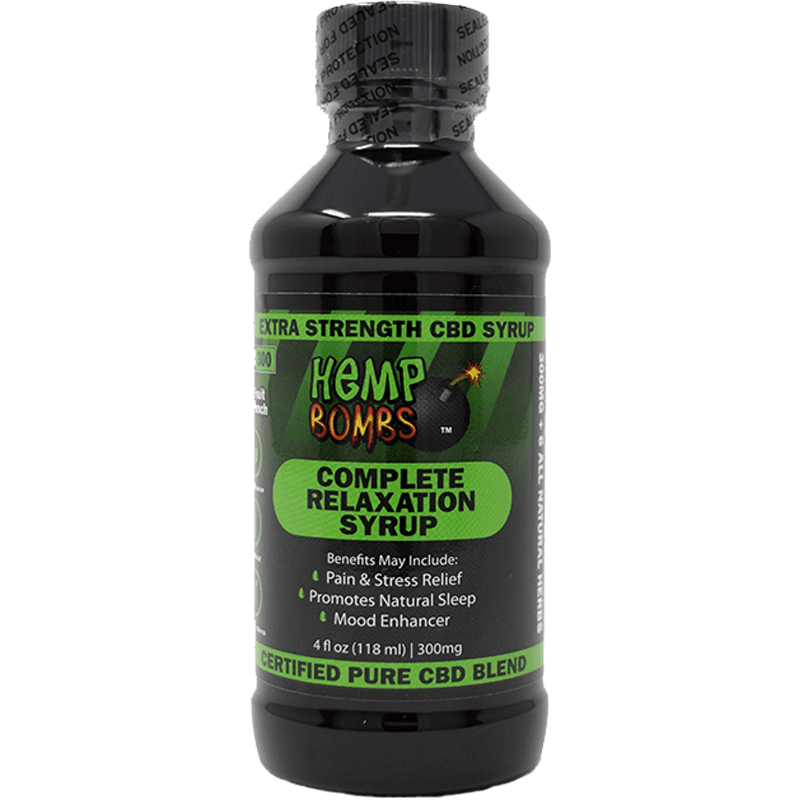 While our vape tanks are intended for one-time use and contain one milliliter of CBD E-Liquid, Hemp Bombs CBD E-Liquid comes in a 16.5-milliliter container and can be used in any compatible vape device. Do Hemp Bombs vape products contain nicotine or harmful additives? No. Hemp Bombs products do not contain nicotine or ingredients known to cause bronchiolitis obliterans (“popcorn lung”). I ordered the Wild Blueberry Jam and it tasted wonderful!! Super fast shipping and my husband loves it too!! Very smooth and helps with our aches and pains..will try the Watermelon next time. This is a powerful vape in a convenient cartridge. Would like to see a stronger version. I would try it. VERY GOOD! The best cbd vape I have used to date. It gets the job done on calming my nerves nicely. I need to order some more. Very smooth tasting and I don’t get that harshing of the throat. Amazing results for pain. I’m going to order a bottle of your vape. enjoyed this vape tank in watermelon. a bit pricey, but it’s good stuff. Glazed chocolate donut is delicious! I just ordered two more tanks. I didn’t realize it didn’t come with a battery. Went back and read it right there. My fault. All good. Best vape tank I’ve gotten in the past year. Highly recommend it. The marshmellow flavor wasn’t that great. But the watermelon is kickin. Totally satisfied with the 1000mg tank. Great product and a wide variety of flavors. Blueberry is the jam! And the smoke is killer. I originally tried the 300mg vape and it worked well but i felt that it could be stronger. this 1000mg is just what I’ve been looking for. I deal with chronic pain on a regular basis and this vape is easy for me to use whenever i want plus it doesn’t taste bad like other medications and vapes. Love this company, so reliable and professional. This stuff is so delicious. Prompt delivery, a friendly company. It def helped me relax, I ordered 4 of these and I’m loving it. Wish I could rate this higher!! Absolutely love it so easy to use. It’s sleek and easy to carry around. I love Exotic watermlon, pineapple and roasted Colombian coffee. I take a few hits before going to class it helps ease down my anxiety. Perfect for someone who plans on vaping all day. ?? I keep this in my purse for use any where, any time. Feel really nice on this product. Mango flavor is killer. Great watermelon flavor! Really nice. Not too sweet, but just fruity enough. i love trying out new products you guys offer. You never let me down! Just saw this posted on your Facebook page and I literally purchased this RIGHT after. Can’t wait for it to arrive. Everything you guys make is a hit. I don’t see these being any different. I ordered the Chocolate Donut and Strawberry Milk today. This should be good in the sugar cookie flavor. Placed an order for it with the 20% promo code you sent. I enjoy all your products so I got the vape email today and made an order for the 1000mg watermelon.